Charles Oliver grew up in the royal household during the reign of Queen Victoria. After Victoria’s death, he endeared himself to George V and Queen Mary. Even when he retired, he remained very close to the palace and the entourage of Elizabeth II. It was Charles Oliver’s wish that the wealth of material he had gathered over the years should be compiled into what he described as “a cookbook with a difference.” He made one stipulation—that it should not be published until after his death. This is that book. And that book has a slug anecdote—let’s call it a slugnecdote—contained within. The meat of this slugnecdote (anecdlug? 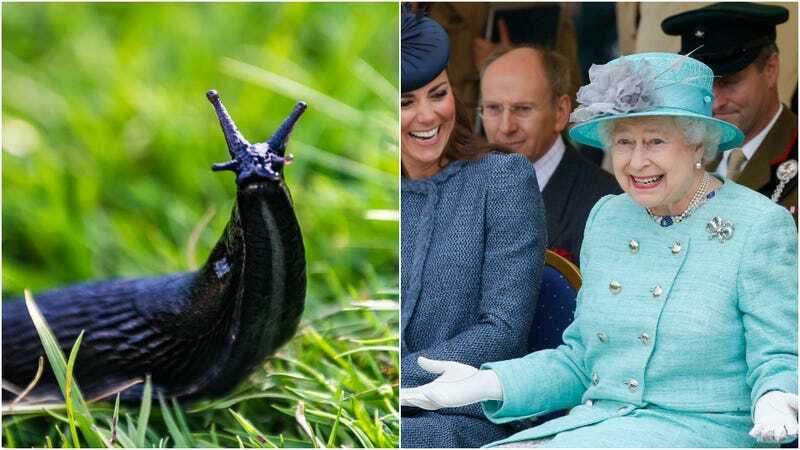 Nah, slugnecdote) isn’t that Her Most Illustrious Majesty found a Most Noble and Venerated Slug in Her Most Verdant Salad. It’s what HRH did after. Apparently, the Commander-in-Chief of the British Armed Forces and Sovereign of the Most Noble Order of the Garter sent the royal analog equivalent of a strongly worded email. She then sent it back to Her Most Well-Stocked and Regal Kitchen, where it was read by the chef. There’s no mention in the Daily Mail of what the chef said when Her Most Splendid Communication And Also Bug Conveyance System was received. Guess we’ll have to wait for the book’s release in February to find out.